On the 4-hour chart, the price fell to the level of 14.89, which has already been unsuccessfully tested several times in the current month. When fixing below it, the fall will continue to the level of 14.80. Otherwise, a correction to the levels of 15.50 (correction 23.6%, the middle line of Bollinger bands) and 15.15 (correction 38.2%) may begin. Technical indicators, in general, reflect the maintenance of a downward trend. Bollinger bands are directed downwards. The MACD histogram increases in the negative zone. However, the entry of Stochastic into the oversold zone does not exclude the start of an upward correction. 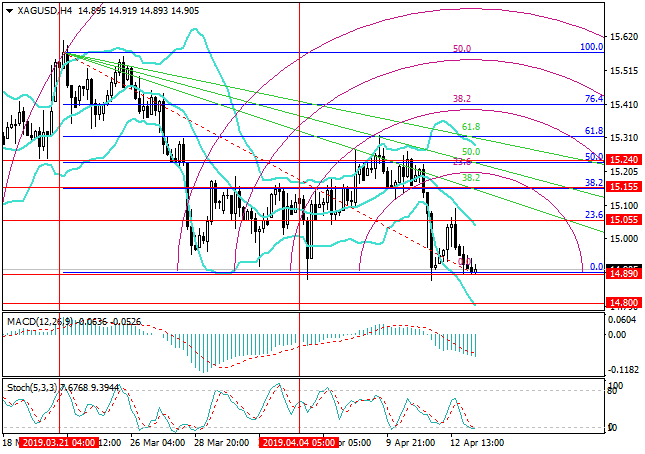 On the daily chart, the price dropped below 14.98 (correction 50.0%) and reached the line of the upward correctional fan 61.8%. Fixing below it will let it decrease to the level of 14.73 (correction 61.8%). Reversing above the level of 14.98 will lead to an increase to 15.15 (the middle line of Bollinger bands) and 15.24 (correction of 38.2%). Technical indicators reflect a decline. Bollinger bands are reversing downwards. The MACD histogram is stable in the negative zone. Stochastic is pointed downwards. The continuation of the price decline to 14.73 (correction 61.8% D1) is more likely. 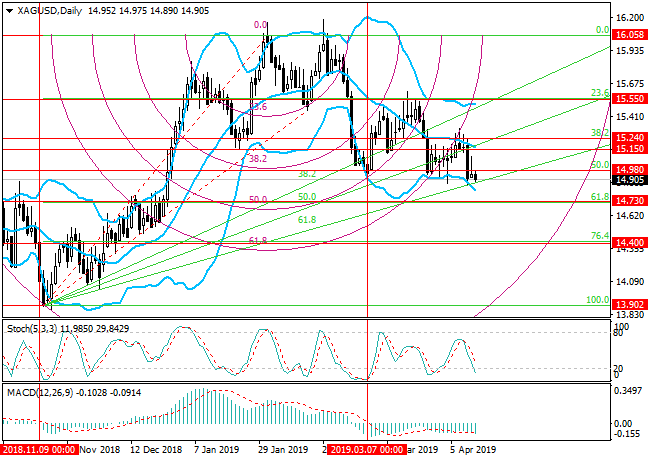 However, the correction to the 15.15 (correction 38.2% H4, the middle line of Bollinger bands D1) and 15.24 (the accumulation of corrections 38.2% D1 and 50.0% H4) is not excluded. Resistance levels: 14.98, 15.15, 15.24. Short positions can be opened below the level of 14.87 with the target at 14.73 and stop loss around 14.94. Long positions can be opened above the level of 14.98 with the targets at 15.15, 15.24 and stop loss around 14.88.